How fun does this hummus look? Beets are such a cool root vegetable to work with because of their bright, bold, and unique colour. The betanin that gives beets their colour, also add a good dose of antioxidants to your meal. 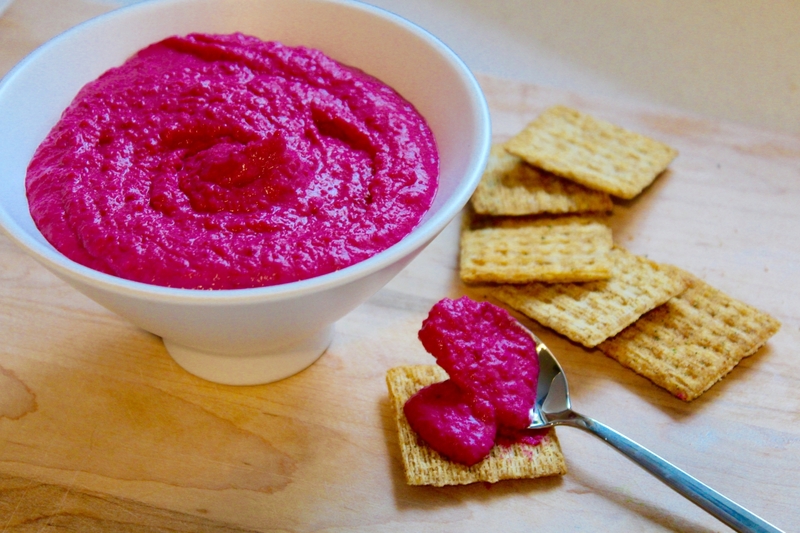 There are more to beets than borscht (although I have a great recipe here for that here), and this hummus is an easy way to add more beets into your diet. Cannellini beans, on the other hand, are a white kidney bean. Because cannellini beans are softer than chick peas, they make a super smooth hummus texture. Like all pulses, cannellini beans are a great source of plant-based protein, fibre, and folate. 1) Pre-heat oven to 350F. Peel the raw beet and cut it into quarters. Toss them in olive oil and then wrap each quarter in tinfoil. Bake at 350F for ~30-40 minutes. Once baked, let cool and unwrap. 2) Open and rinse the can of cannellini beans and add to your food processor or blender. Add all the other ingredients including the cooked beets.